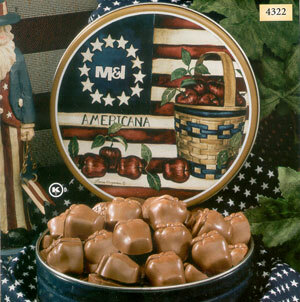 Our Americana art tin contains 9 oz. of melt-in-your-mouth, apple-shaped chocolates with a smooth caramel center. Shipping weight: 2 lbs. Measures 6 5/8” diameter x 1 7/8”. Case pack: 12. Prices shown per piece. Engraving area: 1 1/4” diameter inside circle of stars. 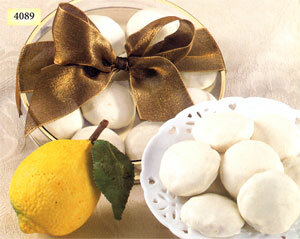 Delicate, delicious lemon flavored cookies come in a round, see-through container. Containing 5 oz. of elegant cookies, it can be personalized with a label and topped off with the attractive ribbon. Shipping weight: 2 lbs. 6” diameter x 1”. Case pack: 12. Prices shown per piece. Perfect for trade shows, sales meetings or anytime! 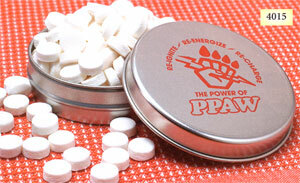 Attractive silver tin holds two (2) ounces of refreshing mints and prominently features your 1-color logo imprint on lid. Sold in case packs only. Shipping weight: 9 lbs./case. Tins are 3” diameter x 7/8” high. Case pack: 48. Prices shown per piece. Imprint area: 2 1/2” diameter. 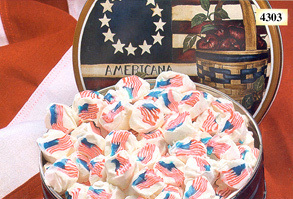 This red, white, and blue taffy comes in our Americana Tin. It is sure to be a delight at any occasion. Net weight: 8 oz. Shipping weight: 2 lbs. Measures 6 5/8” diameter x 1 7/8”. Case pack: 12. Prices shown per piece. Engraving area: 1 1/4” diameter inside circle of stars.